To become financially literate, competent and savvy requires an understanding of basic economic principles and their practical application to personal finance. As readers of my blog, you know I’m dedicated to explicating and exemplifying those principles through the Curve metaphor of personal finance. That’s why I want to tell you about FamZoo. FamZoo has created an elegant and engaging virtual family bank application for the net. Sure it’s fun and easy to use. More importantly it’s a financial education powerhouse. FamZoo’s core is based on the economic principles necessary to master the skills required to become financially competent and capable. FamZoo enables real experiences with repetition, which is fundamental, to real understanding and confidence. Repetition, from my perspective, is simply more effective than read-it-once content or play-it-once games. Let’s take a quick look under the hood at several FamZoo components, the principles behind them and their effectiveness in developing personal finance skills for your children. FamZoo starts with a discussion between the banker (parents) and account holder (the child) where decisions are made as to allowance and how to allocate that ongoing allowance (scarce resource) between different virtual bank accounts and goals. From the get go, therefore, several fundamental economic principles and their application to personal finance come into play, the most important of which is dealing with scarcity. By definition allowance is a fixed amount, its not unlimited, it’s scarce. Since it’s scarce, choices have to be made as how it should be allocated. For example, how much should go to current spending (food, movies, etc. ), how much to savings for goals, (iPad, car, college), and how much for things beyond self like charity. So here’s where your child’s learning kicks into hyper drive – through continuous and ongoing economic decision-making supported by FamZoo’s what-if components (budgeting and goal planning) and historical tracking. FamZoo tracks allowance, spending and goal allocations. As your children’s wants and circumstances change over time, new goals need to be added and previous decisions need to be revisited and evaluated, revised or scrapped. Occasionally kids need financing (loans) for big ticket items. Through its budgeting, goal planning and loan components FamZoo has the tools which foster the creative and effective what-if exploration for making those decisions. Think about it, repetitive real experiences, real world money problem solving, family and general communication skill building, team building; all in an elegant and easy to use interface. FamZoo gives your kids a real shot at mastering money skills with confidence. Check it out for yourself and click here. Gallery | This entry was posted in Financial Literacy Basics, Planning Tools and tagged Financial Literacy, Financial Planning, Money Management, Personal Finance, Personal Financial Planning. Bookmark the permalink. Agreed! Loving the picture!!! 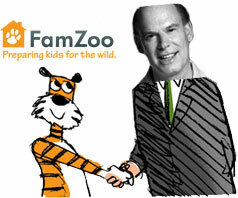 Can’t wait to check out FamZoo for myself! The best yet! LOVE THE PICS!!! BRAVO!! !